I'm not sure where the guys at the University of Oklahoma Police Department buy their malt liquor, but where I come from, it only comes in 22oz, 32oz, 40oz and if you are lucky, dusty 64oz from the back of the cooler at Dell Farm. Technically speaking, a Smirnoff Ice, or anything else of similar atrocity is malt liqueur... But really, it's not a term in common usage, and I gotta think they wanted this to be user friendly... by drunk people... right? C.) We had to go buy more. 4.) Have you illegally pissed on anything/anyone? For wine, they only have the listing "common table wine." But what if I'm drinking "uncommon table wine"? I'm no commoner, you know! Or what if I'm just drinking wine, without the table? They definitely need to rethink their list. 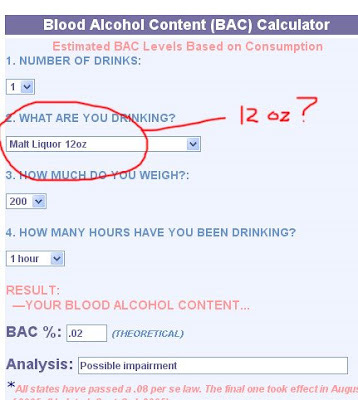 And, btw, their chart tells me that I'm not impaired right now. But I beg to differ! Yeah, you are right. But 99% of all other malt liquors are in forty. Didn't the Micky's caps have a riddle in the cap that got easier and easier the more you drank?